Glow will revolutionalise Scottish education - do you know about it? Over the next month East Lothian teachers will be among the first to try out the Glow portal with their students in the classroom. So, after an unplanned break on this blog (we've been working really hard on getting the new Exc-el ready for you) we'll be introducing more Glow Mentors and getting a sneak peak at what's around the corner with the national intranet and its collaborative tools. Don Ledingham, Head of Education in East Lothian, outlines how Glow Mentors and other teaching staff can have a direct effect on how education is shaped within the authority. Using social media, such as a personal blog (or posting here) or simply leaving a comment on a manager's blog, anyone in the authority can have an significant impact on decision-making. Don Ledingham continues his vodcast on how East Lothian's policy will only help Glow mentors in their work of facilitating change. Key to this are the concepts in the "5Cs": consistency, continuity, collegiality, creativity, collective responsibility. Find out how these ideas will help you effect change for the better in your school in this hi-quality chaptered video, or by clicking play on the rough and ready GoogleVideo below. Next time around, Don goes through the issues in detail and suggests how he and the Glow Mentors might make a difference in East Lothian schools. 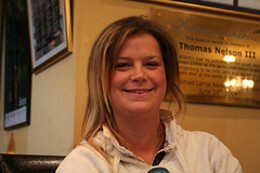 Tess Watson is the first of our East Lothian mentors to be featured on the eastlothianGlow blog. She's based in Knox Academy, Haddington. Just days after the mentors' meeting she felt the need to share her ideas for teaching biology and other subjects with technology - and with mentos - and has started her own blog. There are a large number of people who will be able to help teachers, students, parents and the community get to grips with Glow, the national intranet for Scotland. One group of such individuals are your "Glow Mentors" - we would love a change of name, too ;-) Over the next few months we will meet them online and they will share their own aspirations, fears and ideas. But these people have a specific job - to see you offline, in school, at the chalkface. Don Ledingham, Head of Education in East Lothian Council, met the Authority's "Glow Mentors" for the first time this September. Glow is the national intranet for Scotland, being rolled out from November 2006. It will provide some cool collaborative tools all under one roof for Scottish teachers, parents and pupils. But to help these groups get the most out of it a small group of mentors will be there to support. In this vodcast, Don outlines what he sees as the main steps for change. He uses a metaphor model to help stage the major changes in teaching and learning over the next few years.